Ernest was baptised at St. Pauls Church, Dorking on 17th November 1876. His father is Henry, a labourer, and his mother is Esther (nee Garnley). Their address is Cotmandene, Dorking. In the 1891 census his family are living at 5 Harrow Road in Dorking. Henry, Ernest’s father, is a gardener. He is 52 and was born in Ashtead, Surrey. Esther, his mother, is 48 and was born in Dorking. Ernest is 14 and an errand boy. There are four other children: William J (13), Walter John (10), Annie Jane (8), and Esther Lilian (4). The 1901 census finds the family still living at 5 Harrow Road. Henry is still a gardener and Ernest is a shop assistant in the boot trade. Walter is a nursery gardener and Esther Lilian has no occupation. Annie Jane is a housemaid with a family in Dorking and William J is boarding with a family in Chiswick. He is a tram car conductor. Ernest’s mother Esther died on 17th May 1901. 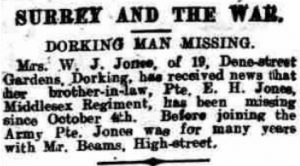 In the Electoral Rolls of 1910 and 1909 Ernest is living at 30a Hampstead Road in Dorking with his brother Walter John. In the 1911 census Ernest is living at 23 Orchard Road in Dorking. He is a boot salesman. In the same house are his brother Walter John and Walter’s wife Harriet. Their father Henry is a patient at the County Asylum in Woking. Ernest died on 4th October 1917. On this day his regiment was involved in the 3rd Battle of Ypres in Broodseind. 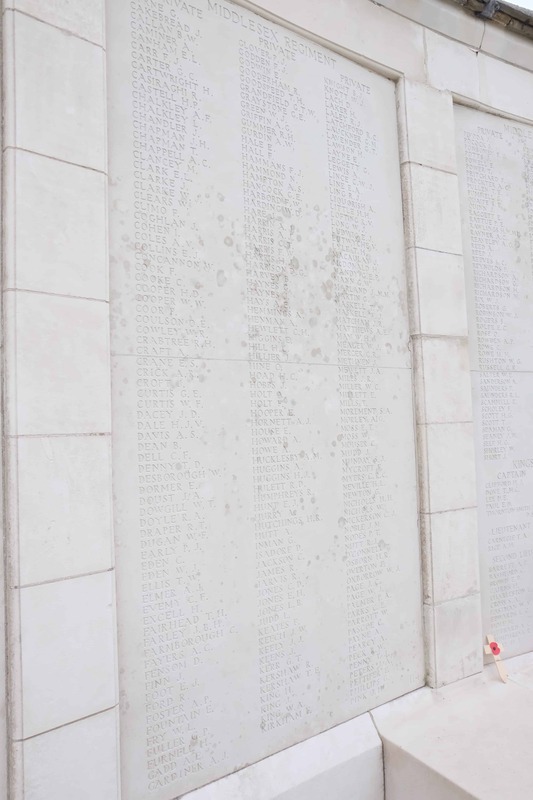 He has no known grave but is commemorated on the Tyne Cot Memorial Panel 113 – 115. Place of Death Ypres, Belgium.